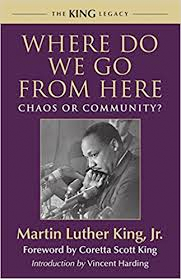 Where Do We Go from Here: Chaos or Community is the last book Martin Luther King, Jr. penned before his assassination in 1968. It’s a series of essays in which Dr. King addresses the status of the Civil Rights movement, its progress, what has held it back and what he believes it will take to move it forward. While it was written 50 years ago, I am stunned by how much of his writing is 100% relevant today. Not just because we have much yet to accomplish in the realm of race relations, but because we have much to accomplish in the realm of justice. When I chose this King books to read, I didn’t realize it was his last one – that was just an added bonus. Because it is his last book, I think we can safely assume that the thoughts contained within remain his foundation, his heart, his true ideals. “Occasionally in life one develops a conviction so precious and meaningful that he will stand on it till the end.” This quote from the book appropriately describes the ideals within and where Dr. King stood at the end. In reading this book, I found context around many of his famous quotations. For example, the well-known idiom, “Darkness cannot drive out darkness: only light can do that” isn’t just a general statement on the existence of racism in America. It is in his essay on why he didn’t favor the Black Power movement and remained dedicated to a nonviolence. I think a fundamental issue in race relations is perspective. As a white female, I have no idea what it is like to be black. This book gave me a stronger appreciation for how true this is. In one of his essays, Dr. King talks describes how, “Even semantics have conspired to make that which is black seem ugly and degrading.” He points out that of the 120 synonyms for “blackness” at least 60 of them are offensive while of the 134 synonyms for “whiteness,” all of them are favorable: soot vs. purity; black sheep vs. white sheep. Thus, he points out, it is no wonder that at a very young age, black children feel inferior while white children learn to feel superior. This is perspective I’ve never considered. What I loved most about this book was how applicable his thoughts about the civil rights movement apply to so many areas of injustice that we still struggle with. “There is a tragic gulf between civil rights laws passed and civil rights laws implemented.” And later, “Laws only declare rights; they do not deliver them.” While this is still the case for many issues of race, it spans other areas, like gender wage equality. But the real reason that we must use our resources to outlaw poverty goes beyond material concerns to the quality of our mind and spirit. Deeply woven into the fiber of our religious tradition is the conviction that men are made in the image of God… If we accept this as a profound moral fact, we cannot be content to see men hungry, to see men victimized with ill-health, when we have the means to help them…We are inevitably our brother’s keeper because we are our brother’s brother. Whatever affects one directly affects all indirectly. While he’s still talking about the world stage here, how applicable is this still in America? It is impossible to discuss everything in one post that I felt was meaningful. There’s an appendix in the book where he outlines his social programs. He focuses on what he feels are the three main institutions that must be address – education, housing and family – and how the three tie together for true equality. Also, as you would expect from a preacher, he has much to say to the church, and role in both the problem and the solution. Unenforceable obligations are beyond the reach of the laws of society. They concern inner attitudes, expressions of compassion…Such obligations are met by one’s commitment to an inner law, a law written on the heart. The ultimate solution to the race problem lies in the willingness of men to obey the unenforceable… Desegregation will break down the legal barriers and bring men together physically, but something must touch the hearts and souls of men so that they will come together spiritually because it is natural and right. As long as there are problems with the heart of man, there will be problems between man and man. This will likely be the most important book I read all year, and I can’t recommend it highly enough.